We of cityhomeCOLLECTIVE are unwaveringly suckas when it comes to a good cause. We go ape for the arts, and we certainly can’t decline an invite to help out gifted youngsters. 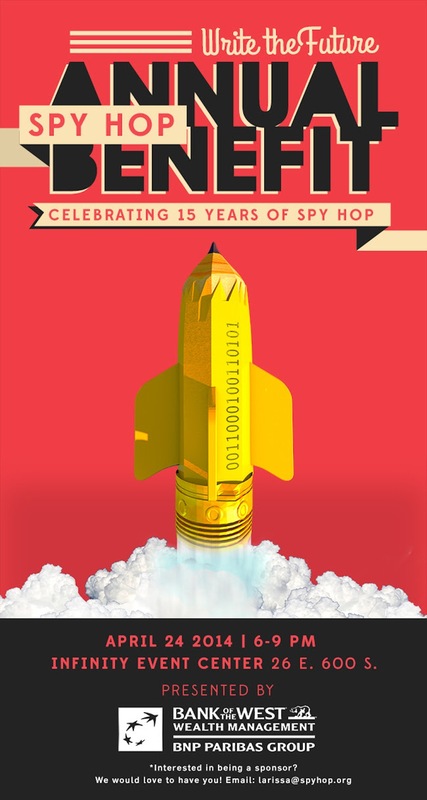 Spy Hop--one of Utah’s most legit organizations when it comes to doing good by the kiddies of our city--mentors youths on the perks of being empowered through digital media arts. The Spy Hop mission is all about creating a safe space for kids to foster their “personal and artistic expression”--and we’re kinda all about that. Spy Hop uses professional-grade equipment and mentors to help the youth of Utah find their voice [and, over the last decade and a half, the org has helped a cool 1,600 kids do just that]. This year marks the organization’s 15th [please hold all applause], and the 2014 Annual Benefit is set to be equal parts inspiring + actual fun [the event has been named “Best Arts Fundraiser” by City Weekly]. Aptly titled Write the Future, this year’s benefit will celebrate 15 years of do-goodery while funding the cultivation of some pretty great minds. Admission will get you access to a stellar party, a silent auction, and the Fund-A-Project live auction. And with food and drink sponsors like Tuscany, Oasis Café, Red Iguana, and Red Rock Brewery, we can all but guarantee that the grub will be next to godly. Oh, and did we mention that 100% of the night’s proceeds go towards outfitting young minds with the tools to tackle the future? You can totally applaud now.